Viewing 12 of 12 items. The traditional baby gift that will be a keepsake for many years. 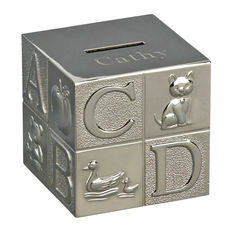 Our ABC Block Bank is a traditional keepsake gift with our non-tarnish nickel plated finish. Bank features raised alphabet letters..
A classic piggy bank! This metal bank has a shiny non-tarnish nickel plated finish so you won't need to spend time polishing it, instead you will be able to spend time counting your money. 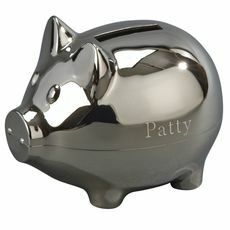 The piggy..
A modern twist on the classic ceramic piggy bank. The piggy bank measures 5.25" high x 3.5" wide x 5.5" long. 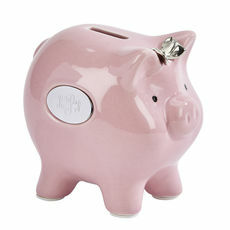 The slot to insert money is located on the top of the pig's back and..
A modern twist on the classic ceramic piggy bank. The piggy bank measures 4.75" high x 3.5" wide x 5.5" long. The slot to insert money is located on the top of the pig's back and..
Vroom vroom! 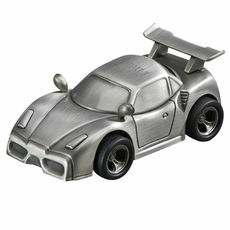 This personalized sports car bank is done in a non tarnish brushed pewter finish and has genuine rubber tires that are mounted on alloy rims and actually spin. 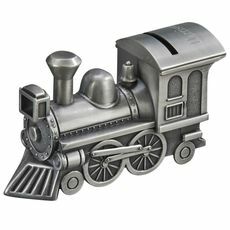 The coin slot is on the..
Our classic train engine bank is beautifully crafted and plated with our non-tarnish nickel plated finish. Produced with amazing, detailed artwork, there is room to personalize the item on the engine..
A classic teddy bear bank! 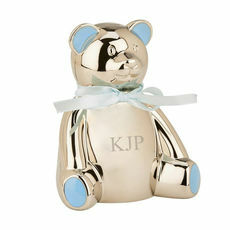 This metal bank has a shiny non-tarnish nickel plated finish with blue highlights on its ears and feet. A blue ribbon tied around its neck is included. The bank measures..
A classic teddy bear bank! 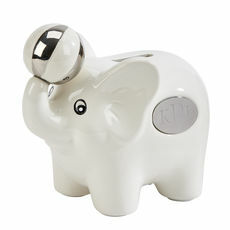 This metal bank has a shiny non-tarnish nickel plated finish with pink highlights on its ears and feet. A pink ribbon tied around its neck is included. The bank measures..
All aboard! 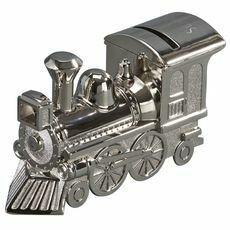 Our classic train engine is beautifully crafted and plated with our non-tarnish antique pewter finish. 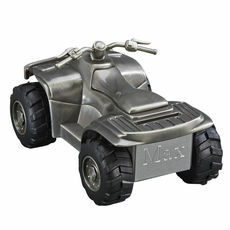 Produced with amazing, detailed artwork, there is room to personalize the item on the..
Take your savings on a wild ride with this All Terrain Vehicle Bank. This bank is done in a non-tarnish brushed pewter finish with genuine rubber tires that are mounted on alloy rims and allow the..
Two by two they marched onto the ark. 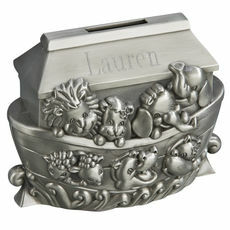 This personalized Noah's Ark bank features 9 sets of animals, 5 pairs on one side of the ark and 4 pairs on the other side. 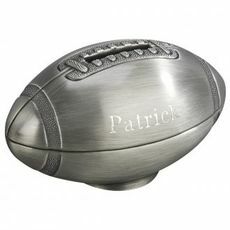 This bank is produced in a..
A traditional keepsake gift with our football shaped bank with a non-tarnish brushed pewter finish. Coin slot is located in the middle of the laces on the ball. Overall dimensions of the bank is..